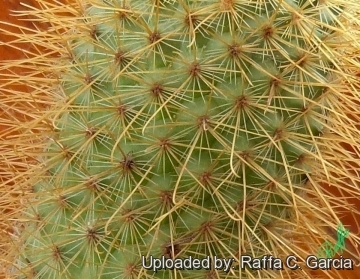 Origin and Habitat: Mammillaria magnifica is endemic to Mexico, where it is distributed in the states of Morelos and Puebla. Altitude range: 1,000 to 1,550 metres above sea level. Habitat and Ecology: This species is probably found in deciduous forest. The threats to this species are unknown. 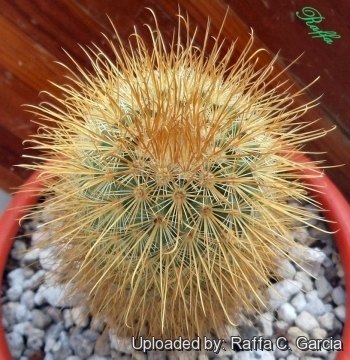 Description: Mammillaria magnifica is a fine but poorly known taxon that form clumps of tall column bristling with yellowish brown, hooked central spines. 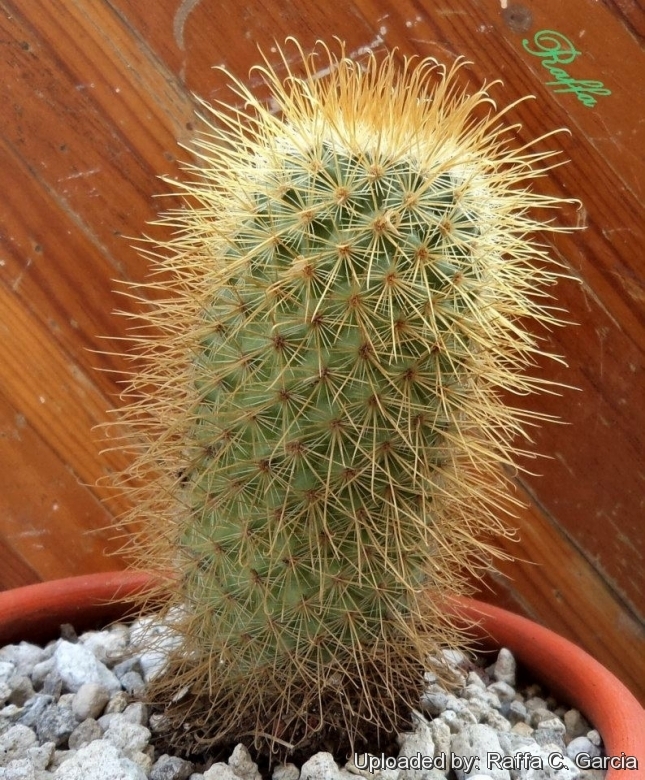 It is a rapidly growing, clumping species but often distinctly tatty or tired-looking in cultivation. However the plant will reward the skilled growers with ring of fine rose-purple flowers circling the crown of the plant. There are several forms known, some with gold spines, some with red to black spines. The large stem will grow towards the sun, changing direction in just a few weeks if the plant is turned. Derivation of specific name: The specific epithet magnifica means (lat. Magnificus) gorgeous. Stems: cylindrical, to 40 cm tall, 5-9 cm in diameter. Tubercles: Pyramidal or conical, with latex, axils with white wool and bristles. Central spines: 4-5, sometimes as many as 8, the lowest one hooked and to 15-55 mm long, remainders shorter, strong, straight ,needle-like, yellowish brown to pale brown. Radial spines: 18-24, straight, glassy white or yellowish, 3-8 mm long. Flowers: Purplish red or pinkish red circling the crown of the plant, to 17-20 mm long, 11-15 mm in diameter. Fruits; Club shaped, pink with green tips, 5-22 mm long. 1) Goettsch, B.K. 2013. Mammillaria magnifica. The IUCN Red List of Threatened Species. Version 2014.3. <www.iucnredlist.org>. Downloaded on 30 January 2015. 11) David Hunt: "A new review of Mammillaria names L−M." In: Bradleya. Jg. 3, 1985, S. 57−58. 12) Cactáceas y Suculentas Mexicanas. Jg. 12, Azcapotzalco, Mexico City 1967, S. 3. Cultivation and Propagation: Mammillaria magnifica is a great looking small columnar plant that offsets eventually but has nasty hooklets that grab you if you get too close. Itis not particularly difficult on own roots. No special cultural requirements. Growth rate: It is a rapidly growing, clumping species that will produce wonderful clumps of very heavily spined plants. From seed, it will fill a large pot in just a few years. Offsets are produced freely, and are distributed somewhat randomly. Since the plant can make wide spreading mounds, shallow pots of large diameter will be required as the plant ages. Hardiness: Reputedly sensitive to frost, but less so if kept on the dry side prior to, and during, cold weather. However warmth throughout the year will increase the grower's success (8-12°C during rest season).